The AC dynamometer cutting-edge solutions are helping car makers around the globe to meet specific development targets. Electric motor or engine manufacturers, particularly in the automotive industry, are striving to improve performance and the overall driving experience for their customers, but they are also faced with the challenges of reducing the environmental impact. Therefore, testing solutions need to be sophisticated and accurate, while being cost-effective and efficient. The demands on the functionality of AC dynamometer control systems is always increasing, particularly in the research and development arena. In addition to its modular flexibility and user-friendly controls, brand-new state-of-the-art control system enables the end user to build a system tailored to specific and individual needs. As such, the powerful microprocessor can either be used on its own, with a user- friendly desktop control panel, a GUI (desktop PC or laptop or tablet), or with a customer’s existing instrumentation. Another key attribute of the AC dynamometer closed loop control module is that the user can connect to the host system through a variety of industry standard interfaces, including CANbus, EtherCAT, USB and RS232 connections, meaning that engineers do not have to write their own software to talk to the control module. The base unit offers a selection of digital and analog on-off channels for controlling and measuring temperatures, pressures, speed and torque levels, as well as being compatible with data acquisition modules to allow for a flexible, low-cost hardware extension to the system. POWERLINK CAC series AC dynamometer is the loading of dynamical machine power test. The standard electric dynamometer consists of an AC induction motor or permanent magnet synchronous motor, a torque sensor, a base and a flange connected with the power machinery, a four-quadrant AC converter system and dynamometer measurement and control device. As a power absorption unit, AC dynamometer takes the absorption of the engine or electric motor output shaft power transfers efficiently as electric power. The electric power feeds back to the grid with the quality AC energy. The energy conversion and feedback efficiency can reach 90% or above. In addition, the savings in operation and maintenance costs make electric dynamometer economy even more impressive. With the POWERLINK control system, not only speed and torque of a variety of rotating machinery can be accurately measured and controlled, but also the temperature, pressure, flow, current, voltage and other parameters. * Can choose air-cooled, water-cooled or heat exchanger cooling. POWERLINK AC dynamometer torque sensor using the Germany contactless torque flange, which is highly accurate, durable and can be used in oily and dusty industrial environments. Such harsh environment happens in the automotive industry especially the engine test stands. The below diagram shows the typical AC dynamometer torque characteristics (Blue curve: normal operation. Green curve: overload operation) and electric dynamometer power characteristics (Red curve: normal operation. Purple curve: overload operation). AC dynamometer torque is constant when the electric dynamometer operates from zero speed to rated speed. During the rated speed to the maximum speed, AC dynamometer torque is decreased when the speed is increased. The power is constant from rated speed to the maximum speed (Sometimes the power starts to drop before maximum speed). User should provide the external characteristics in order to select the suitable AC dynamometer. The basic principle of hydraulic dynamometer and eddy current dynamometer is to convert the mechanical energy generated by the prime mover into heat energy, which is taken away by the water cooling. The energy from the prime mover cannot be recovered and the energy in the conversion process also needs to be consumed. The AC dynamometer can convert the mechanical energy generated by the prime mover into electrical energy and can be fed to the internal power grid for other devices. Neither water supply system nor water cooling system is needed for AC dynamometer in which conventional hydraulic dynamometer or eddy current dynamometer requires. So there is no sewage discharge and bring a good test environment. 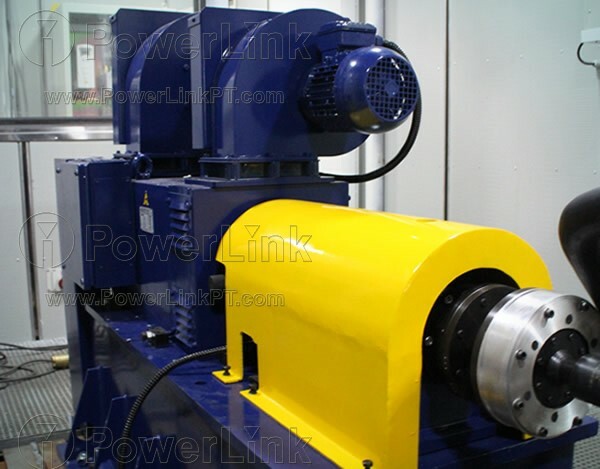 The load characteristics of POWERLINK CAC series AC dynamometer has constant torque characteristics from zero speed to the rated speed, and constant power characteristics from rated speed to the maximum speed. This is in full compliance with the load characteristics of power machinery. Usually, the hydraulic dynamometer can only be loaded in one direction. Even the eddy current dynamometer can be bi-directionally loaded but cannot be used as a power-dragging prime mover, AC dynamometer can easily realize bi-directional loading and can be used as a power dragging prime mover. The AC speed regulator of POWERLINK CAC series AC dynamometer is supplied by ABB or Siemens. Motors and sensors have been strictly tested by state authority in full compliance with relevant standards. Because the accessories are in full compliance with national standards, users do not have to rely on the manufacturers for the maintenance and can carry out their own routine maintenance, even in the need to replace the host and the sensor. Users can independently complete. Due to the limitation of the control response and the moment of inertia, the hydraulic dynamometer or eddy current dynamometer cannot meet the requirements of the transient test. AC dynamometer is the only equipment which can realize the transient test. POWERLINK AC dynamometer torque sensor uses Germany torque flange, which is highly accurate, durable and can be used in oily and dusty industrial environments. Such harsh environment happens in the automotive industry especially the engine test stands. Torque flange is a non-contact torque sensor which consists of a rotor and a stator. The rotor flange is directly connected with the motor and rotates with the motor shaft. The torque is output as the pulse frequency signal through the stator. The torque measurement accuracy can reach ±0.05% FS, overload capacity 200%, damage load ≥400%. The sensor structure is novel, compact, high dynamic respond and can provide fast transient speed and accurate torque measurement. ABB ACS880 series variable frequency inverter control cabinet is used in AC dynamometer as the control of load motor and drive motor in the system. ACS880 series frequency converter modular design has many functions and shows extraordinary performance on the security protection, communication ability and energy feedback. The distribution and feeding system adopts IGBT which the harmonic is less than 5%. The distribution and feeding systems are in line with international standards IEEE-519 or integrate filters in distribution and feeding system to meet the requirements of power grid.